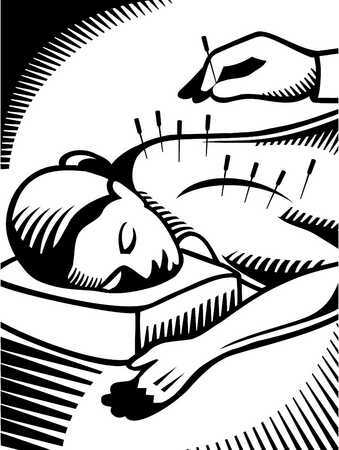 Have you ever gone for an acupuncture treatment? If so, I’d love to hear what your experience has been. If not, I thought you might find my experience with acupuncture of interest/use. I have been going for acupuncture treatments for three years now and love it. The original reason I wanted to try acupuncture was for the tendinitis in my wrists (due to writing). But like many people, I suspect, I didn’t get around to trying acupuncture until my mid-forties because I was wary of the needles. Okay, truthfully, the needles freaked me right out! I couldn’t figure out how all those needles – I don’t care what size they are – going into my skin couldn’t hurt. Instead, what the needles do, for me at least, is create an incredible sense of well-being and relaxation. Within minutes of the first needles being inserted, I begin to drift into a deeper level of consciousness. My acupuncturist, Wendy, usually begins with my ears, for overall re-balancing, and then moves on to whatever area – often my forearms or shoulder – needs attention. After all the needles have been inserted, she waves some sort of nicely scented oil near my face, then puts on the ocean-waves-lapping-against-the-shore music and leaves the room. So Wendy sees two very different versions of yours truly on treatment day. There’s the bouncy, arms-waving-while-talking-a-mile-a-minute Maryanne who arrives for her appointment (with seconds to spare) and then there’s the quiet, relaxed, zen-like (rarely sighted in public) version who floats out an hour later. As for my tendinitis? It is much better now that I am managing it in multiple ways: daily stretches, wearing wrist guards whenever I am typing, regular massage therapy and acupuncture. According to my handy little “Acupuncture in a Nutshell” booklet, this traditional Chinese medicine practice has been around for 5000 years. Practitioners of acupuncture are able to tap into the intelligent, energetic system, that is inside each of us. Known as Qi (pronounced “chee”), this intelligent energy apparently maintains health and balance in the body. When Qi is balanced and flowing freely through “meridians,” the body’s natural self-healing abilities are activated, enabling internal stability and harmony to occur. Meridians are like rivers inside the body and Qi flows through meridians as an invisible current, energizing, nourishing and supporting every cell, tissue, muscle, organ and gland. But a blockage in meridians will restrict the supply of Qi – and this blockage can manifest into various signs and symptoms. Over the time, the body as a whole becomes weakened and its self-healing abilities are compromised. An acupuncturist develops the skills to evaluate the quality, quantity and balance of Qi flowing within the body – and then gently places tiny, disposable, sterile needles into specific acupuncture points. Acupuncture allows Qi to flow to areas where there is a deficiency and away from an area where there is an excess. 1. It can strengthen the body and provide a strong foundation for the body to prevent future illness and disease – if a person has consistent treatments i.e. once per week, month, or 6 weeks. Consistency is the key no matter the interval between visits. One or two visits 6 months apart will not do this but can help to strengthen the body. 2. It activates the natural self-healing abilities of the body. 3. It is an ideal way to get well and maintain wellbeing at any age. 4. It is customized to the person being treated i.e. not the same treatment for everyone. The training for acupuncturists is either a 3 or 4 year program. So be sure to find a practitioner that is registered in the country in which they are practicing. If you are interested in learning more about acupuncture, a good place to start would be the AcuTake website. The Madrona Massage website also has some helpful information. Also, my friend Esther Kane, RCC, recently posted an excellent blog about her experience with acupuncture and traditional Chinese medicine, along with some resource recommendations. If you happen to live in the Sidney or Saanich area, I highly recommend a visit to Wendy Courtemanche, R. Ac., at Madrona Massage. Wendy will give you $10.00 off the initial consultation and acupuncture treatment (regular $95.00 for 1.5 hour). Wendy also offers a no-charge 15-min consultation where a prospective new client can come and get a feel for working with her and address any questions or concerns they may have with regard to their treatment or acupuncture in general. Feel free to e-mail Wendy at acuhealth11@gmail.com or call Madrona Massage at (250) 656-0311 for further information. To book on-line, please visit the Madrona Massage website. About Wendy Courtemanche, R. Ac. Wendy first became interested in acupuncture when she was working in Australia and suffered from crippling migraines. She tried acupuncture to relieve the pain. Within four sessions, she felt better than she’d had in years. So, upon moving back to Canada, she enrolled in the International College of Traditional Chinese Medicine and then finished her training at the Canadian College of Acupuncture and Oriental Medicine. She is registered with the College of Traditional Chinese Medicine Practitioners and Acupuncturists of British Columbia.